Arrive Colombo International airport transfer to the kandy.Visit a Spice Garden at Mawanella - and see the luscious Cinnamons, Cardamoms, Pepper plants etc. You can also purchase your requirements of spices.Commence city tour of Kandy, including Upper Lake Drive, Market Square, Arts and crafts Centre, a Gem museum and a lapidary and the Temple of the Sacred Tooth Relic.Kandy - the hill capital. The last stronghold of the Sinhala Kings was finally ceded to the British in 1815. Kandy is an example of the Buddhism’s influence in Sri Lanka today. Temple’s shrines and monasteries keeping alive Buddhist traditions are everywhere. Temple of the Sacred Tooth Relic - ever since 4th Century A.D, when the Buddha’s Tooth was brought to Sri Lanka hidden from sacrilegious hands in an Orissan princess’ hair, the Relic has grown in repute and holiness in Sri Lanka and throughout the Buddhist world. It is considered Sri Lanka’s most prized possession.Gem Museum & Lapidary –Sri Lanka produces the finest quality of gem in the world. We mine semiprecious gems, the sapphires of Sri Lanka, which are very exclusive and comes in shades of blue, red, green, white…act. Be a witness of the cultural show. Kandyan Dance is a dance form that originated in the area called Kandy of the Central hills region in Sri Lanka. But today it has been widespread to other parts of the country. Overnight stay in Kandy. After breakfast visit to the Royal Botanical Gardens at Peradeniya. Royal Botanical Gardens, Sixty Seven hectares of exquisite beauty and botanical treasurers containing more than 4000 species, this is haven not only for Scientists but to every nature lover as well.Thereafter transfer to Pinnawela. 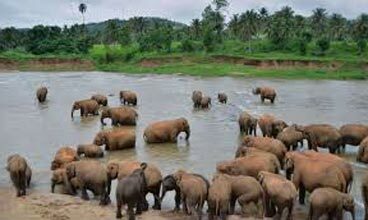 Visit,Pinnawela Elephant Orphanage - Started in 1975 to house the abandoned and the wounded, the orphanage has grown to be a big family today. The number of elephants has increased to more than 65 now, including baby elephant brought from various parts, as well as 14 babies born as a result of the captive breeding program. 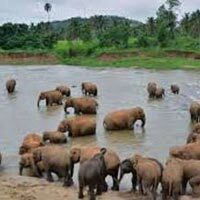 The best time to visit is the feeding time and the bathing time when the elephant are taken to the river close by. A unique experience never to be missed. Afterwards proceed to Colombo. Overnight stay in Colombo. Colombo - like many capital cities in developing countries Colombo is fast changing its face. Almost overnight, skyscrapers arise from where old buildings once stood, yet in some parts; the old world charm is retained. A 100-year-old clock tower and several British built, colonial buildings are still to be seen in the city. The Pettah bazaar – where one can shop for bargains, a Hindu and a Buddhist temple, residential areas where you find the stately homes of the affluent, the Colombo museum, the Bandaranaike memorial international conference hall – anoutright gift to Sri Lanka from the people’s republic of china, the new parliament in Sri Jayawardenapura and the folk art center are some of the places of interest that one can visit to Visit shopping complexes such as ODEL, HOUSE OF FASHION, MAJESTIC CITY.